MPWD: Abandonment of an aging cross country water main and replacement of 1,400 LF of water main along Davey Glen Road. CITY: Trenchless replacement of 1,200 LF of sewer main and associated structures, replacement of 16 LF of storm drain pipe, and one-inch overlay pavement restoration along the length of the utilities construction. MPWD: Replacement of 830 LF of PVS water main and addition of fire hydrant at end of Francis Court. CITY: Construction of 792 LF of new sewer main and associated structures, abandonment of 409 LF of existing sewer main, four-inch pavement reconstruction, and slurry sealing along the length of the utilities construction. MPWD: Abandonment of 600 LF of PVS water main on Academy Avenue and relocation of 22 service connections, and replacement of 150 LF of PVS water main on Belburn Drive. CITY: Construction of 714 LF of new sewer main and associated structures, trenchless replacement of 317 LF of sewer main in easements, abandonment of 543 LF of existing sewer main, two-inch overlay pavementrestoration, and slurry sealing along the length of the utilities construction. Construction is anticipated to begin in April 2018. 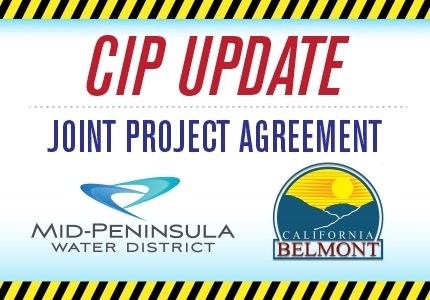 Project updates will be available on both the City of Belmont and MPWD websites.